People living in parts of the South East are set to benefit from access to some of the fastest broadband speeds available (up to 330 Mbps), providing enough bandwidth for a family of four to all stream ultra HD or 4k quality movies or TV simultaneously. It’s after Openreach, the UK’s largest telephone and broadband network, announced the next 81 locations – including parts of Berkshire, Essex, Hampshire, Hertfordshire, Kent, London, Surrey and Sussex - to be upgraded under their ultrafast broadband investment. This latest work in the South East uses a technology called Gfast, which builds on existing infrastructure, changing the way broadband signals are transmitted to make them ultrafast without the need to dig up roads and install new cabling all the way to the property. 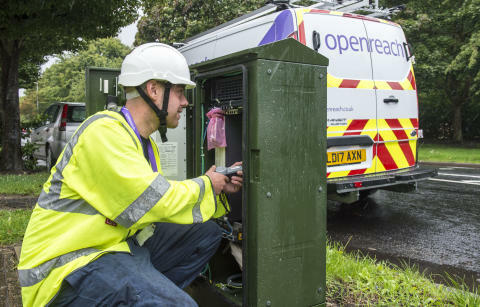 The rollout will see Openreach engineers building on the existing high speed broadband network across the South East where 97 per cent of homes and businesses already have access to superfast (speeds of 24Mbps and above) broadband. With superfast broadband, things like uploading and downloading music, films and photos all happen quickly and it’s great for studying or working from home. Across the South East of England more than 4,600 people are employed by Openreach, most of them engineers. And that team is expanding, after it was announced earlier this year that more new engineers are being recruited throughout the wider region to help with the ultrafast broadband rollout. Acomb, Addiscombe, Aintree, Ascot, Bargoed (Cardiff), Barking, Barnsley, Beckenham, Beulah Hill (Croydon), Blackpool, Bootle, Bradford, Broadwell, Canonbury, Chingford, Colchester, Colindale, Dalton in Furness, Daubhill, Deal, Dover, Downland (Croydon), Earley, Eastbourne, Eastleigh, Enfield, Faversham, Felixstowe, Feltham, Forest Hill, Godalming, Greenwich, Hamilton, Harlesden, Hatch End, Healing, Hendon, Hitchin, Hyde, Kemptown, Kentish Town, Kenton, Leicester Central, Leytonstone, Lincoln, Littlehampton, Llanrumney, Lords, Lower Holloway, Midland (Birmingham), Mill Hill, Moss Side, New Malden, North Wembley, Northampton, Oldham, Pendleton, Plympton, Ponders End, Prescot, Primrose Hill, Purfleet, Rainham, Rock Ferry, Rushey Green, Stalybridge, Stamford, Stoke City, Sydenham (Croydon), Teddington, Tewkesbury, Tranent (South East Scotland), Upper Holloway, Urmston (South Manchester), Wallington, Waterloo, Wembley, West Kensington, West Wickham, Willesden, Worthing. Gfast ultrafast speeds let you download a two-hour HD film in just 90 seconds, a 45-minute HD TV show in just 16 seconds, or a nine-hour audio book in just three seconds. Openreach is a wholly owned and independently governed division of the BT Group, and it is a highly regulated business, with more than 90 per cent of our revenues generated from services that are regulated by Ofcom any company can access our products under the same prices, terms and conditions.